Remember the first time you saw a Rubik's Cube, and were blown away by the way it was built to twist arbitrarily in any direction? The Geometrical Pocket Tripod evokes a similar response of admiration for intriguing engineering design. 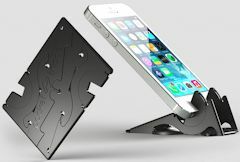 This is a mini-tripod for iPhones that collapses to the size and thickness of two credit cards. You can carry it in your wallet, so it's easily available to set up as a stand for watching movies or for long video calls. Just pull it out, twist and snap it into shape, insert your iPhone in either landscape or portrait orientation, and then adjust the viewing angle as desired. See the free Pocket Tripod iPhone app to see the transformation in 3D. Setting up the Pocket Tripod starts with twisting it 180 degrees around the diagonal on a barrel hinge to form a more triangular shape. Then flip up the sides -- the perpendicular form provides a sturdy frame with cut-outs to provide more stability. Finally, the sides have two cut-outs to hold the iPhone -- which also rotate, so you can easily adjust the angle. The result has a solid feel, with the parts clicking securely into place and the cut-outs moving smoothly but with enough resistance to hold the phone. The Pocket Tripod is another Kickstarter success story, and a fun and clever piece of work. It's available for $25, with models for iPhone 5/5s, or 4/4S, in black or white. It comes with a Fit Card with cut-outs of openings for planned adapters to hold other devices or various iPhone cases. Entries posted to Manifest Tech Blog in July 2014, listed from oldest to newest.